We celebrate and chronicle the lives of our children growing up in many ways: by collecting pictures in albums, taking home movies and telling and retelling our favorite coming-of-age stories. sleep. Inspired by their 9-year-old daughter Katie, who sings and performs with them, this is not just a delightful songbook meant to amuse and entertain youngsters. It’s also a thoughtful look into the heart of what it means to be a parent, and has been produced with the exquisite and professional musical detail and collaboration of friends like David Benoit and Greg Karukas. 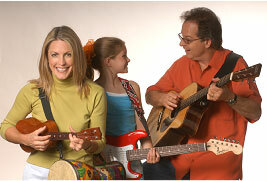 The award-winning CD (2004 Parents’ Choice Award) moves us through a child’s day, harnessing the pure fun of kite flying, and the delight of remaining (and singing) in our jammies after improvising an orchestra with utensils from the kitchen drawers. And after all the noise and chaos subside, the stars come out and we hear the wistful voice of a mother sing a protective lullaby over the warm blankets of (finally) sleeping children. Pat Kelley is a popular and successful jazz guitarist with a career that takes him around the world playing with luminaries such as George Benson, Natalie Cole, David Benoit, Dave Brubeck and Dave Koz. He has released (connect with rest of the sentence) over a half-dozen albums of his own and plays regularly at the Jazz Bakery in Los Angeles. Francie Kelley has been singing all her life and has her own business as an art consultant. When Katie was born, Francie and Pat redesigned their lives to give the biggest share of their hearts to her while still remaining true to the rigors of their creative lives. This collection of their songs bears witness to the success of both. The song “Babies Won’t Keep” is a beautifully executed lament on the relentless passage of time during infancy when after months of careful watching we suddenly realize that our baby is fast becoming a youngster, and there’s nothing we can do to hold it back. And the simplicity and grace that Francie brings to “Happiness” from You’re a Good Man Charlie Brown is a heartbreaking tribute to those years in our childhood when we were still mostly free of the burdens of life. David Benoit’s superb accompaniment make this rendition among the best I’ve ever heard. If you listen very closely to these wonderful twelve songs, you’ll be taken back to those incredibly poignant moments when playing was all you had to do, and when every little thing you came upon was a wonderment. You’ll remember again how easy it is to have fun, and how quickly your companions would share your fantasies. And better yet, you’ll shut your eyes and feel the warmth and absolute security of someone you love very much, carefully tucking you into bed, and the sweetest most perfect sleep that follows. Chuck Pendergast is a Los Angeles-based author and free-lance writer. “Jammin’ in our Jammies” (space) is a FREE fun songfest, a concert and a celebration of Francie Kelley’s CD, Wake Up & Go To Sleep, Saturday, May 21 at 2 p.m. at the Goleta Border’s, 7000 Marketplace Ave. Francie, her guitarist husband Pat Kelley, and their daughter Katie will all sing songs from this award-winning CD and family collaboration that celebrates the days and nights of children. Everyone is invited to come in their “jammies”, so get out your best pair.